Professionalization has been one of the key developments in the field of political communication in recent decades. In this context, message design plays an increasingly important role. The term refers to a collectively performed practice of creating, implementing and evaluating patterns of sayings and writings to promote political organizations and their goals. This contribution presents insights into the research on those practices as well as into the methodology for their investigation. Peter Stücheli-Herlach (Prof., PhD), Carola Etter-Gick (M.A.) 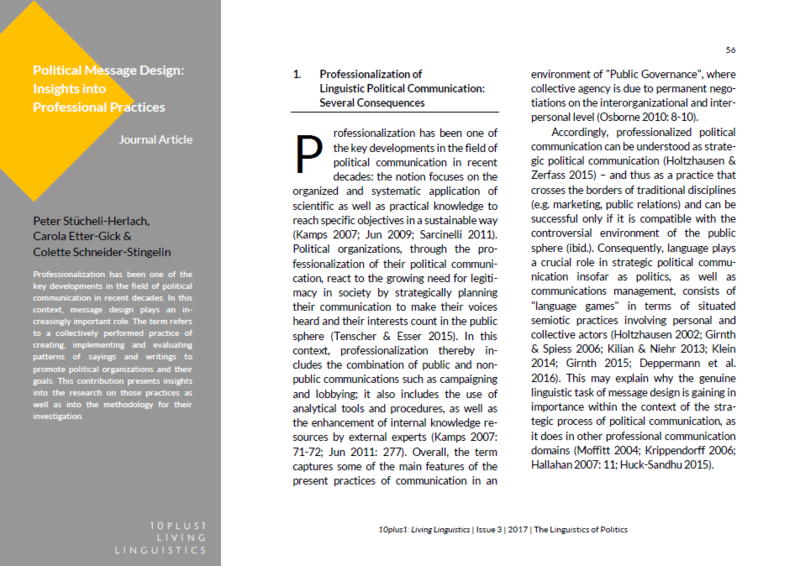 and Colette Schneider Stingelin (PhD) are the Core-Team of the Certificate Course „Political Communication“, which is a part of the Master of Advanced Studies „Communication, Management and Leadership“ at Zurich University of Applied Sciences (Switzerland). They work together for the main research focus „Organizational Communication and Public Sphere“ of the Institute of Applied Media Studies (IAM). Among the important publications are: „Schreiben mit System“ (Peter Stücheli-Herlach and Daniel Perrin, Eds., 2013); „Gesundheitskampagnen in der Schweiz“ (Colette Schneider Stingelin, 2014).